Here are some excellent natural and organic skincare and beauty products I discovered when pregnant. I simply can’t live without these, even now as a Mummy! If you want some real pampering when pregnant using natural and organic skincare products, so as not to absorb any dangerous chemicals through the layers of your skin, try the brilliant range of Trilogy Skincare products. 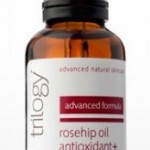 Trilogy is a New Zealand company who use organic Rosehip Oil, renowned for it’s restorative and anti-ageing properties. Trilogy do not test on animals. As an added bonus, I was lucky enough to get through my pregnancy without one single stretch mark to show for the 9 months (+2 weeks!) of my gradually blooming tummy. I put my luck down to the regular use of Trilogy products, gently rubbing Trilogy 100% Natural Certified Organic Rosehip Oil over my expanding belly, which helped to prevent stretch marks and was a wonderful way to bond with my growing baby as I talked to her at the same time (she thought it was marvelous having a gentle daily massage and rewarded me with plenty of little kicks and punches)! I like to use the Everything Balm as a body moisturiser, it smells divine! I still use Trilogy 100% Natural Certified Organic Rosehip Oil as a facial oil during winter to keep my skin moisturised and the Trilogy Everything Balm is multi-purpose so worth carrying around in your pram bag! I’m so glad I used Trilogy products when I was pregnant, I couldn’t have done without them – and they’re such great value. With my new baby cradled in my arms and pressed closely against my bosom, the last thing I wanted to do was to transfer chemical-laden creams, potions and lotions onto her delicate skin. I decided I had to go completely chemical-free and discover the joys of organic, natural skin care. I feel ethereal for making a choice that benefits myself, my baby, the environment and Green People products are not tested on animals. Can it get any better than this? Green People make everything you could wish for, at a fraction of the cost of many other skincare brands. I highly recommend these products which I use as part of my daily beauty regime.